Microblading & Powder Effect: Do I really need to learn both? 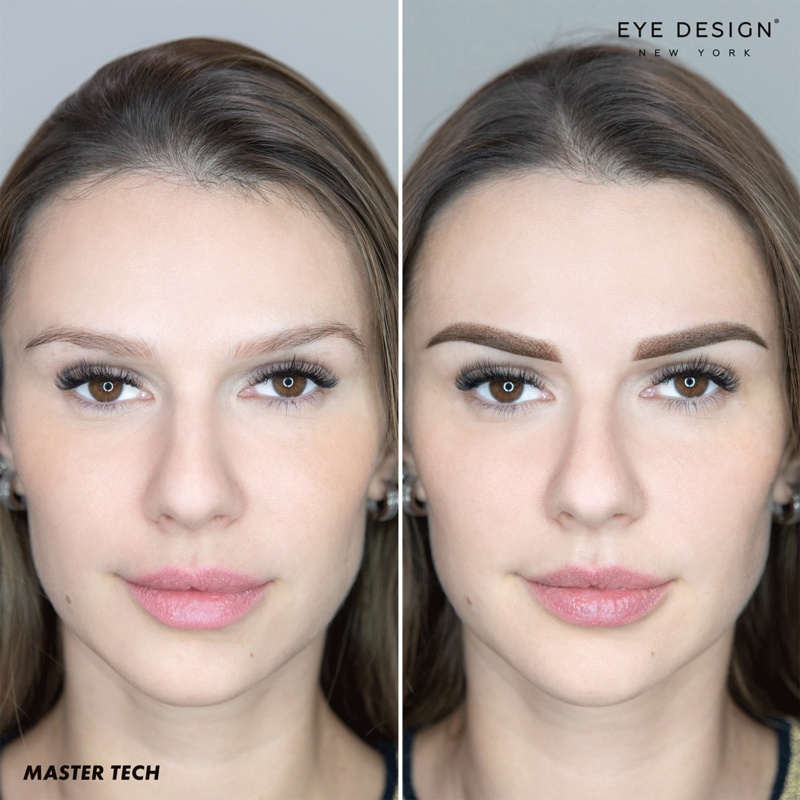 True expert technicians offer both microblading and Powder Effect; they see value in adding the two different brow techniques to their services. It is in your best interest as a permanent/semi-permanent makeup artist to have a solution for every client. The team at Eye Design University wants to make you the best brow artist you can be! We think true expert technicians focus on honing and perfecting a few versatile and truly useful skills. Once you feel comfortable in one technique, it is time to move onto the next. Microblading is a big buzzword in the beauty industry nowadays, and for a good reason. This technique restores brows for those with sparse natural hairs. It is ideal for those with over-plucked or over-waxed brows, or those with hair loss due to age, hormone changes or medical conditions such as cancer or alopecia. Eye Design’s microblading method involves the manual application of hyper-realistic, hair-like strokes with pigments. Our founder and Master Technician Nadia Afanaseva developed our exclusive technique herself. It focuses on natural-looking eyebrow shapes and hair-stroke patterns. For clients with medium to full natural eyebrow hair, we also offer Powder Effect. Unlike microblading, Powder Effect uses pin-dot pigment application to shape, define and darken the brows. Powder Effect, also known throughout the industry as shadow effect, ombré brows or microshading, creates a gradient makeup look. If you no longer wish to apply traditional brow products every day, this technique is for you! In fact, one in three clients can benefit from Powder Effect. Technicians who learn this technique can increase their income by 30 percent or more! It is quickly becoming one of the most in-demand procedures in beauty and may soon surpass microblading in popularity. Nadia believes Powder Effect will continue to be popular for years–even decades–to come! Many times, we combine microblading and Powder for a Hybrid brow! This is the ultimate method for complete and natural-looking brow restoration. Clients with Hybrid never need to use makeup on their brows again (unless they are overdue for a touch-up)! During a Hybrid treatment, Eye Design’s technicians first apply hair strokes with microblading, then add Powder Effect’s pin dots between the hair strokes. Doing so softens the contrast between the applied hair strokes and the skin, making it the best possible solution for clients with the sparsest brows. Great brow artists offer both microblading and Powder Effect; they see the value in adding the two different techniques to their services. Eyebrows aren’t one-size-fits-all, so it is in your best interest to have a solution for every client. It doesn’t matter which technique you decide to learn and start practicing first. They are completely different in many ways, so Eye Design teaches you each method from beginning to end at our MasterClass workshops. You will learn brow shapes, pigment application patterns, color theory and more at each training course. Eye Design University students also practice using our premium professional tools and supplies, with one-on-one guidance from our studio’s most skilled and experienced technicians. Techniques and tools differ between the two techniques. You will want proper training for each in order to be successful. We developed our MasterClass workshops to teach technicians (and aspiring techs) everything they need to know about each method! To learn more or enroll today, visit eyedesignuniversity.com or call (917) 708-8870. We can’t wait to see you in class!